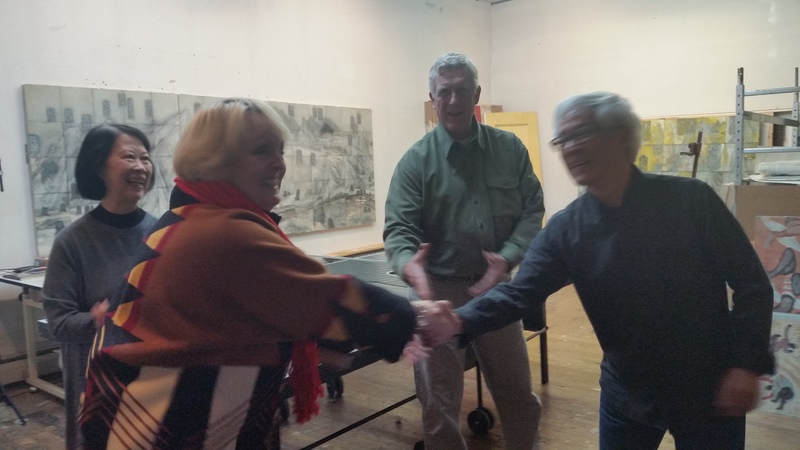 Friends of McCain Auditorium and the Marianna Kistler Beach Museum of Art took a special trip to New York. Guests were offered many unique and behind the scene experiences only few get. Follow as curator Aileen Wang shares her stories and pictures. 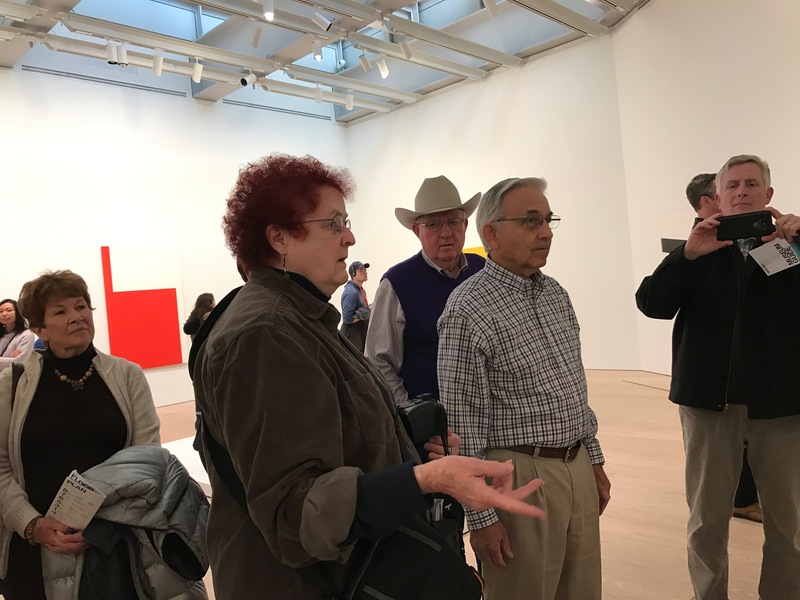 At the Whitney Museum of Art in New York, we had the pleasure of enjoying the work of Bruce Conner, who was born in McPherson, Kansas and grew up in Wichita. Conner’s Crossroads is a montage of declassified military film footage of the U.S. government’s underwater test explosion of an atomic bomb at Bikini atoll in the Marshall Islands in July 1946, as part of Operation Crossroads. 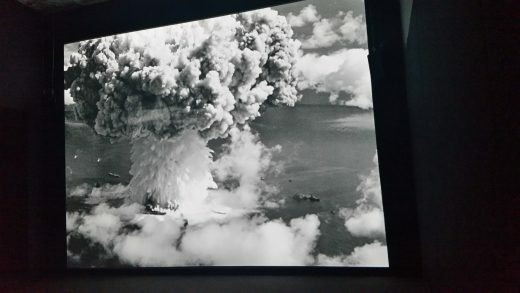 Conner pieced together footage taken from different vantage points and slowed it down, enabling viewers to appreciate the beauty of the mushroom cloud, as well as register the horror of the spectacle. While we were so far away from our homes in Kansas, it was a delight to see such awe-inspiring artwork by a fellow Kansan. Museum of Art. Stay tuned for when that painting will be on display at the museum! Margo is a prominent Kansas artist based in Manhattan and was the first woman to be promoted full professor at the K-State Department of Art. It was a privilege to hear Margo share her ideas! As we left the Whitney Museum, some of us headed to the High Line Park next to the museum. The park was built on a historic freight rail line elevated above the streets where art from various artists is displayed. What we found particularly interesting was Zoe Leonard’s “I want a president” piece that is displayed under a bridge. 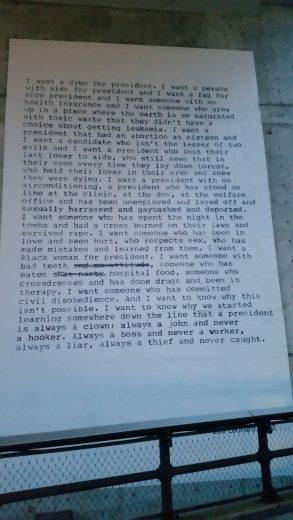 “I want a president” was written by Leonard in 1992, the year that poet Eileen Myles ran for president as an independent candidate. the Arts, and many other museums. Art Students League and soon called New York City his home. 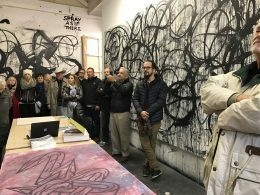 He is internationally renowned for creating works that blend elements of Chinese and Western painting traditions, resulting in a unique style that expresses at once both his Chinese heritage and the American culture he has adopted. One example of that painting can be seen in the front section of his studio, where he welcomed us. The painting adopts the composition of a classic Chinese landscape painting, rendered in a style that reminded us of French Post-Impressionist artist Paul Cézanne. Zhang is also famous for a sculpture he made called Ping Pong Mao, a ping pong table with cutouts of Communist Party Chairman Mao Zedong’s silhouette. During our visit, we spotted the famous table folded up in the back of his studio and convinced him to bring it out for us. Several people in our group got up the courage to play Zhang’s modified ping pong game. Having big holes in the middle of the table required special attention and finesse. We all had fun with the game, but it reminded us in concrete terms how the authoritarian rule of Mao made it hard for Chinese citizens to live. Even though the interactive sculpture specifically references life in China during Mao’s reign in the 1960s and 1970s, its insight into life under a dictatorship is universal and just as relevant now. North Italy, his father’s home. He has developed a signature style inspired by his love of Tokyo and New York street cultures and graffiti. 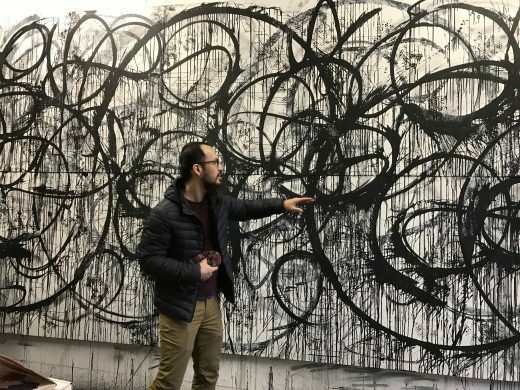 We were very excited to bring our K-Staters to see this phenomenal artist and his recent work. After the studio visit with Enrico, we got an exclusive tour of the Brooklyn Museum with Sharon Matt Atkins, Vice Director of Exhibitions and Collections, while the museum was closed to the public. One thing that stood out to us the most at the museum was the visible storage facility recently built by the museum. This unique way of storing artwork through see-through glass was one of the many reasons we found the Brooklyn Museum to be so interesting. 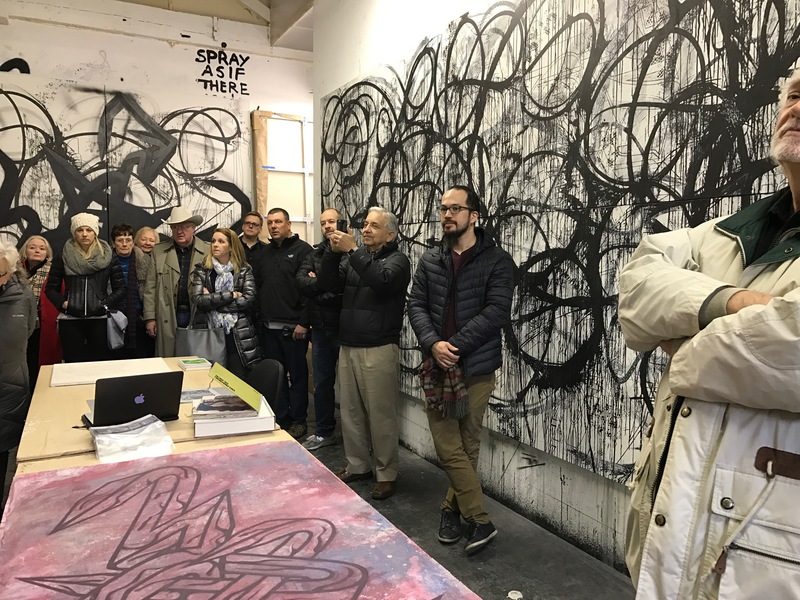 Sharon gave us a gallery talk of the new show she curated, “Iggy Pop Life Class” by British conceptual artist Jeremy Deller, who won the prestigious Turner Prize in 2004.
designer Abbott Miller. Miller is a partner of the world’s largest independent design consultancy, Pentagram, and leads a team designing books, magazines, catalogs, identities, and exhibitions such as The Rolling Stones one that we viewed. 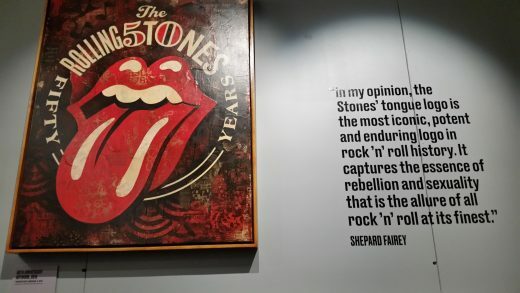 This exhibit features over 500 Rolling Stones items with 50 years of fashion, original artworks and vintage instruments. If you love Rock n’ Roll, this is the place to be. 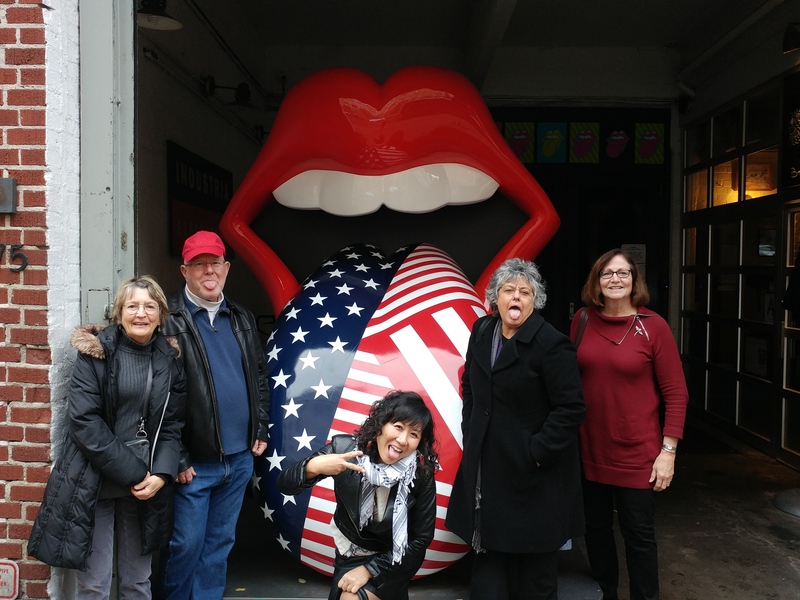 We had so much fun seeing the history of the Rolling Stones and finding the famous and iconic tongue logo all over the exhibit. and Maddie Allen, student curatorial assistant.